At the base of Mt Kenya, set out on safari on foot, on horse or by driving to see white rhino’s and leopards. Beautiful accommodation, perfect for both couples and families awaits your return, with infinity pools and games for everyone. 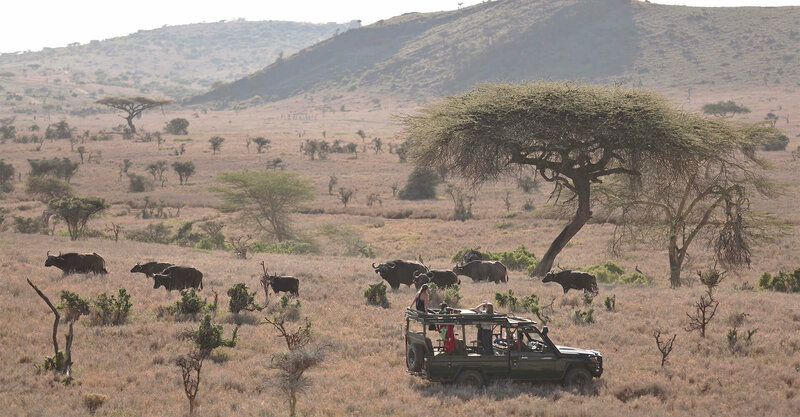 Everything about Lewa Wilderness Trails fits the picture you have of the quintessential African safari. The setting, beside the Equator at the base of the towering Mount Kenya. The near-invisible leopard lounging in a tree. The incredibly rare white rhino glaring at you from the thorny bush. The thatched lodge and cottages. The expert local trackers. The horse rides across the great plains. The giraffe plucking at thorn trees. The elephants ambling past on their way to the river…everything fits the picture. And then Lewa springs one of its great surprises. Your host takes you on a spectacular, open-cockpit flight over herds of game, through towering gorges, over vast forests. It’s an experience you will never forget.